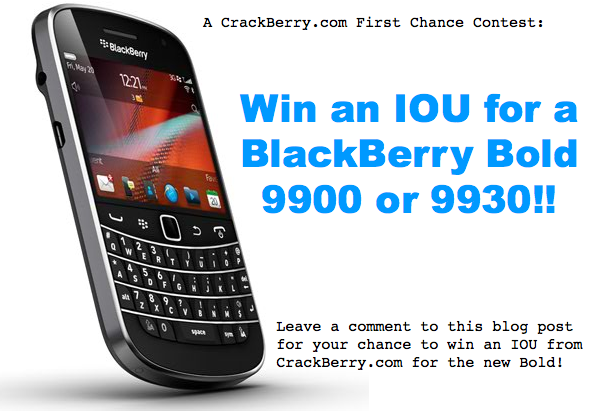 CrackBerry Contest: Win an IOU for a BlackBerry Bold 9900 or 9930!!! OK CrackBerry Nation... here's your FIRST CHANCE to win a FREE BlackBerry Bold 9900 or 9930 (your choice!) from CrackBerry.com. In honor of Research In Motion's official Bold 9900/9930 announcement, we're going to give a lucky reader the chance to win a the phone for FREE along with $100 of free BlackBerry Bold 9900/9930 Accessories from ShopCrackBerry.com. To Enter: Just login to CrackBerry.com and leave a comment to this blog post. If you want to dress up your comment a bit, why not tell us what you're loving most about the newest Bold and why you want it. Details: Contest open worldwide. Deadline on this earlybird contest is midnight on May 31st, 2011. We'll announce the winner on June 1st. Only one comment per person please. When the BlackBerry Bold 9900/9930 becomes available for purchase CrackBerry will purchase and send you the phone. That's it. Good luck everybody. Be sure to check out our BlackBerry Bold 9900/9930 First Impressions. It's an awesome device!